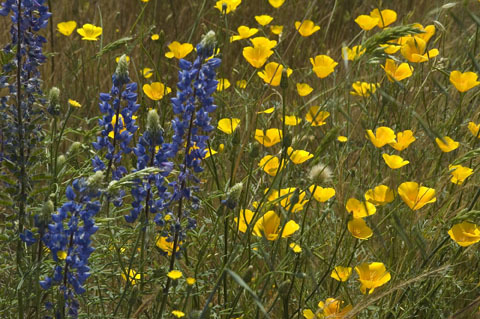 It’s time to start our new Photo Assignment titled aptly, Wildflower. Send in your favorite wild flower photo (including dogwoods, redbud and other shrubs and trees) you’ve taken in the Yosemite area. Send your photos along with your name and a link to your website and we’ll post them on our blog (with a link to your site, of course) as part of our month-long photo assignment showing the beautiful flowers of Yosemite. Sorta legalese: Cut off date for submissions is June5th. All photos remain your property but you give us the permission to post them on Yosemite Blog in conjunction with your name and a link to your website. Submissions should be at least 580px wide and no larger than 1024px wide. Multiple submissions allowed (please send them in separate emails). All entries only accepted by email. Sorry, no links please (we need a valid email address so we can send the prize if you win or correspond with you if the prize requires mailing). Contest open to everyone, anywhere. We’re still looking for local businesses to sponsor the contest. If you’re a local Yosemite area business or your demographic audience is outdoor travel or adventure and you’d like to sponsor one of these contests and get some exposure for your business please contact me.